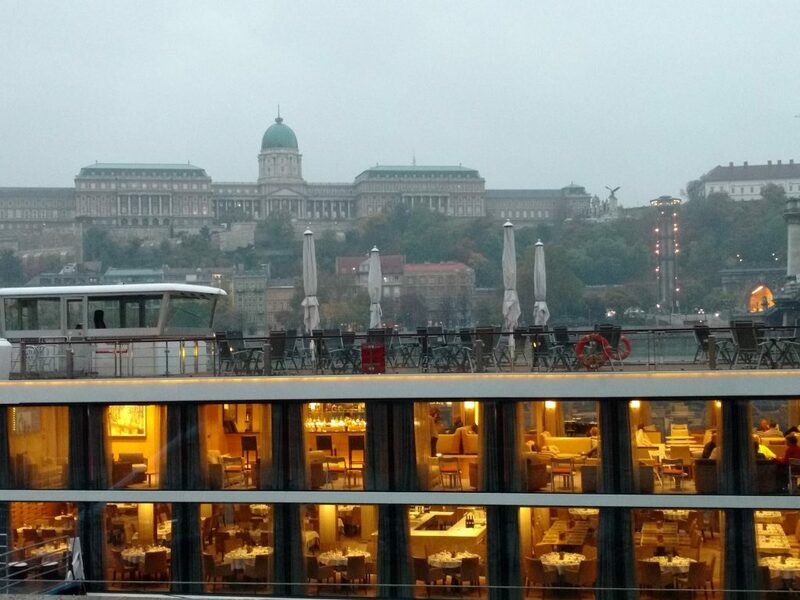 Budapest: The castle on Buda side; in the foreground is one of the many ships that cruise the Danube. Passengers were beginning their trip, unloading suitcases in their rooms. On Saturday, leaving Vancouver, I almost but not quite leave my passport in the photocopy machine in a convenience store on West Broadway. Fetch bags, and off to the airport. It’s a long day, extended by crossing nine time zones and merging two calendar days into one. It is memorable for three events. First: when I enter the skytrain to the airport, I unwittingly walk into a TV shoot for a news story about public transit. The host walks over to me to ask my opinion. The piece is supposed to be about passenger complaints, but I have none. He keeps digging, and finally I say, “I’m sorry but I don’t have any complaints about Vancouver transit. I don’t live here, but as a visitor I find it’s great.” Then he says, “So maybe you think we complain too much?” I say we could definitely do with less complaining. Thus begins and ends my career in TV news. The second surprising event happens at the airport, when I am sitting for a moment by the beautiful Bill Reid carving. I hear a child wailing and look over to see yet another camera crew, this time shooting a man dressed up as a Sasquatch, posing next to Bill Reid’s artwork while in the background a toddler flees in terror. The man removes the Sasquatch head and tries to make amends, but by now the wailer and his family are receding into the far reaches of the food court. Sasquatch, sweating inside his suit, sighs and prepares for another take, while I made my way to the security line. The third event takes place on the 10-hour flight, in the deep of the night, somewhere over Greenland. I am chatting with a fellow insomniac at the back of the plane. She is a retired librarian from Zurich. We are just getting into the meaty topic of how libraries’ role in society has shifted in recent years. All around us people are sleeping, or deep into their third or fourth or fifth movie. Then there is a crumple-thump noise and a woman has fallen out of the toilet cubicle to lie inert on the floor at our feet. The librarian and I stare at each other for an instant, minds scrambling, because at that moment there are no flight attendants in this entire section of the plane. I don’t know enough about first aid to be of use here, so I run past 20 rows to the next section and alert the attendants. Then, to stay out of the way (but reluctantly), I return to my seat. For the next half hour, a dozen uniformed people literally run up and down the aisle fetching various bags, blankets, and kits. I stayed in my seat despite my curiosity. I never did find out what happened, never did get to finish my conversation with the librarian – I couldn’t find her after that. And I never did get to sleep. 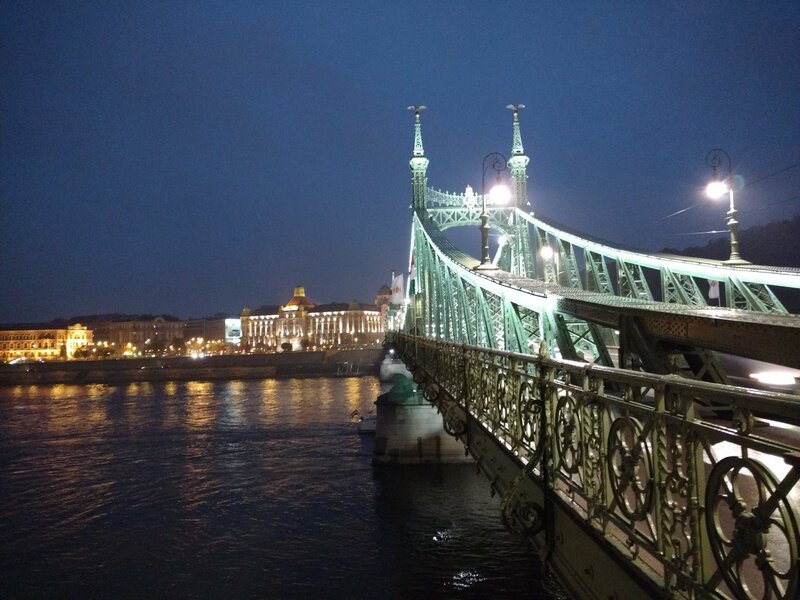 By the time I arrived in Budapest – another flight and several hours later- it was late in the next day. I found the bus to town. I found the hotel, and went out for a walk around Kálvin Tér until I was falling asleep on my feet. I found my way back to the room and slept. 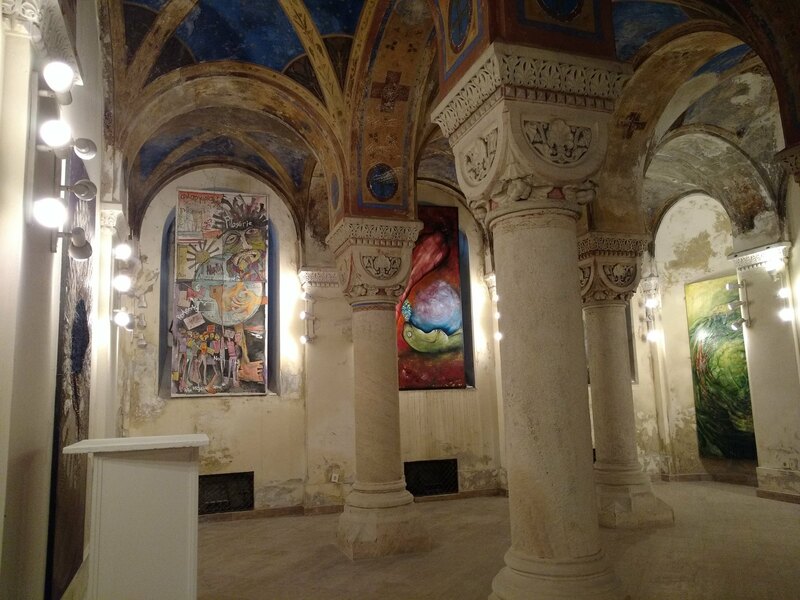 In the dark, I pick my way down the stairway into a church basement that is clearly undergoing renovations, only to discover an art gallery! 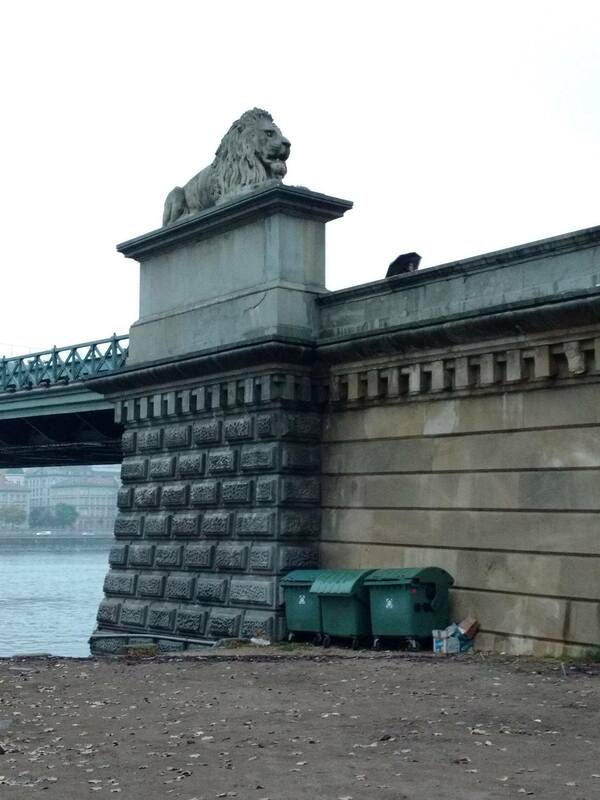 Famous lion at Chain Bridge. I like the placement of the dumpsters. On Sunday, I got up in an effort to adjust to local time, ate a hearty if solitary breakfast at the hotel buffet, and had a day of exploring. The highlight was meeting up with Csenge Zalka, a local powerhouse of storytelling passion and knowledge. In her 30’s, she is just back from 6 years in the USA, where she studied storytelling with the finest. Not just a Master’s degree, but a PhD as well – and this on top of her Hungarian Master’s degree in archaeology. She toured me around the historical Castle District, which was made vastly more interesting by her stories ancient and contemporary. But the best of the visit was sharing a meal at a “fast food” Hungarian hole in the wall, where the food was wonderful and cost hardly anything. We talked about language and literature, about schooling in Hungary and in the US, about politics, archaeology, translations of Greek classics into Hungarian… I could spend a lot of time listening to this woman talk. But meanwhile, I’ll be checking out her blog. She is a force to be reckoned with. One of her current projects is Following folktales around the world. I can hardly wait to read her. Speaking of lively and fascinating people: late tonight the irrepressible duo of Jeff Gere (storyteller) and his wife Dominique arrive. They live in Hawaii. I packed an extra coat for Dominique. (It’s the same one she borrowed when she visited Victoria one year – in August.) Tomorrow we will endeavour to keep warm and dry before the “Romania” part of the Romania Tour begins.